At the last meeting of the Russia-India Inter-governmental Commission, Russia offered to upgrade India’s existing short-range Strela-10M3 mobile air defence system (surface to air missile systems) to the level of the Strela-10M4 or Strela-10MN (night version), making it more combat-worthy. Russia has offered to upgrade India’s existing short-range Strela-10M3 mobile air defence system to the level of the Strela-10M4 or Strela-10MN (night version), Vladimir Slobodchikov, managing director (MD) of the system being developed by the Nudelman Precision Engineering Design Bureau, told RIA Novosti in an interview on Tuesday. “During a meeting of the Russia-India Inter-governmental Commission (IGC), we made a technical proposal to India for the modernization of the Strela-10M3 SAM (surface-to-air missile) systems. A formal offer was made under the aegis of Rosoboronexport,” said Slobodchikov, Doctor of Technical Sciences and member of the Tsiolkovsky Russian Academy of Cosmonautics. The Strela-10 SAM has been under development in the KBtochmash since the beginning of the 1970s. 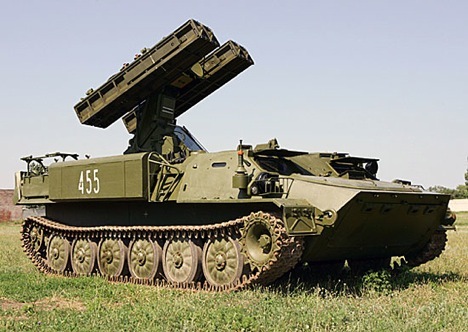 This SAM system has been the flagship product of the company and, by the end of the 1980s, more than 700 of these systems were produced in the Soviet Union, making the Strela-10 SAM the most mass-produced such system in the country, Slobodchikov said. More than 400 such units were delivered to other countries. “Modernization includes the upgrading of the combat vehicle, but we will not touch the rockets. The main drawback of the earlier versions was that the system could not work at night. It did not have thermal sighting capability. These new versions – the Strela-10M4 or Strela-10MN (night version), can work at night, primarily thanks to the introduction of autonomous sector search and target acquisition capability,” said the MD of KBtochmash, which is part of the holding company NPO Precision Complexes OJSC, owned by the state corporation Rostec. The Strela-10M3, he said, required that the operator see the target with his own eyes, or receive targeting information from somewhere, swing the launcher installation at the target, find and capture it, and then launch the missile. “Now the Strela-10MN (night version) has been automated, a device detects a target in the sector, transmits a command to the operator, after which the operator captures the target and shoots,” said Slobodichkov. The Strela-10M4 SAM is designed to protect military units, in various forms of battle and on the march, from air attack and reconnaissance devices, diving and flying at low and ultra-low altitudes.